Locaux30IN30 30IN30 | Claudia Wiens | Locaux! Not often enough do we cross paths with, not only a kindred spirit, but a woman that is genuinely living and walking her talk in the way Claudia is. 1.) A conscious guide of navigating life one thrives in. 2. ) Touches others in ways their vibration is elevated. Kindness is as kindest does. Claudia does kindness. In this episode, Claudia shares her aim to bridge the gaps perpetuated and upheld by false boundaries; be they between languages, cultures or lines drawn on a map. She believes we are all brothers and sisters, and lives to inspire us to care for one another and the planet. Claudia Wiens, Owner of Everyday SustainableClaudia is a yoga and meditation teacher, a Reiki practitioner and sound facilitator. She began her personal yoga and meditation path back in 2003. Later in 2005 and 2006, she trained in Hatha Yoga at the Indian Cultural Institute in Cairo, Egypt. In 2017, she completed another 200 hours yoga teacher training at Gayatri Yoga School in Tenerife, Spain with a focus on Hatha (Sivananda and Satyananda), pregnant yoga, and also the principles of Ayurveda. In 2018 she completed a Restorative Yoga teacher training with Sue Flamm in Spain. Her interest in sound massage and sound healing began in 2013, and after incorporating the use of Tibetan singing bowls in her yoga classes for quite a while, she undertook a sound massage training with internationally renowned sound worker, Jacomina Kistemaker at the Punta de Couso Centre in Galicia, Spain in 2017. At the same place she did her gong training in 2018. 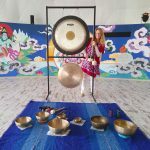 Claudia Wiens currently teaches yoga and meditation and offers sound massage sessions and gong baths in Seville, Spain, but also internationally on her travels. She is also a photographer, artist and author since 1995. She lived and worked for 10 years in Egypt and seven in Turkey and currently calls Seville, Spain her home. She holds a Master’s degree in photo design from the University of Applied Arts and Sciences in Dortmund, Germany. Her work has appeared in international publications such as GEO, Stern, New York Times Magazine and The Guardian and she works frequently for a number of organisations, including UNICEF, GIZ and Johns Hopkins. Her work is frequently featured in numerous solo and group exhibitions at venues like the Kestner Museum (Hanover), Antikenmuseum (Basel), Kreuzbergmuseum (Berlin), HOST Gallery (London) and several Goethe Institutes. She received grants and awards for her photography projects from organisations like Robert Bosch Foundation, Kulturwerk der VG Bildkunst, Friedrich Ebert Foundation, DFB Kulturstiftung. Claudia Wiens is the author of three photo books. She teaches photography workshops internationally for Goethe Institutes, with colleagues or on her own.